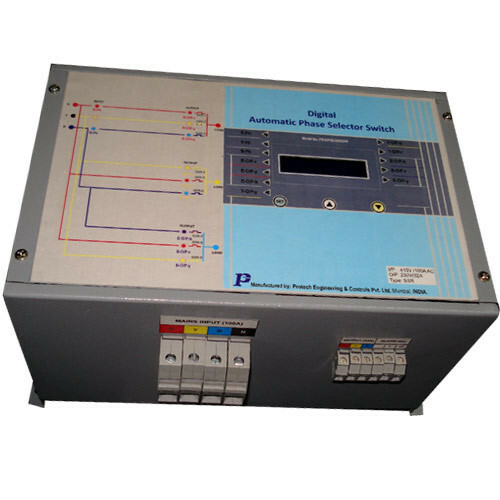 We provide Automatic Phase Selector Switch (APSS), which is a micro controller based automatic phase selector switch. It is used for single phase loads with three phase input supply. We offer customization on our range as per the specification of clients. The unit also shifts the load even when voltage of the supplying phase goes out of U/V-O/V range (Settable). Thus it is useful for un-maned operations & saves the energy of alternate sources, when only 1 phase fails for load shedding or may be failure of fuse or any other cause. The connection is very simple with 3- phase input & 1 Phase output. Looking for “Automatic Phase Selector Switch”?